Album 'The Lark' : “…enter at your own risk.” The Lark reviewed. 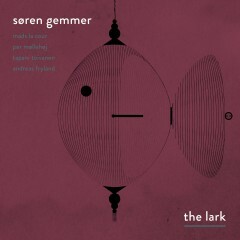 For the sequel to his debut album At First, the Danish pianist Søren Gemmer again cooperated with the same trio now supplemented with Mads La Cour. The latter adds with his flugelhorn-sounds extra lyrical ornaments to the whole. The Lark is above all a quest through the possible combinations of the five instruments. As listener, it is as if you get hopelessly lost in a mirror tent like Orson Welles in The Lady From Shanghai. Everything is constantly on the move and nothing is what it seems. The entry points change continuously. Sharp contours dissipate and glide into sensual animal calls. Poetic passages become transfigured into dark psychological sketches. Behind the sometimes seemingly deliniated decor lie suddenly other dimensions. Enter at your own risk. Chris Weeda was responsible for the right display of the sound.